“North Carolina State University researchers have developed a microfluidic system for synthesizing perovskite quantum dots across the entire spectrum of visible light. The system drastically reduces manufacturing costs, can be tuned on demand to any color and allows for real-time process monitoring to ensure quality control. Over the last two decades, colloidal semiconductor nanocrystals, known as quantum dots (QDs), have emerged as novel materials for applications ranging from biological sensing and imaging to LED displays and solar energy harvesting. The new system can be used to continuously manufacture high-quality QDs for use in these applications. “We call this system the Nanocrystal (NC) Factory, and it builds on the NanoRobo microfluidic platform that we unveiled in 2017,” says Milad Abolhasani, an assistant professor of chemical and biomolecular engineering at NC State and corresponding author of a paper on the work. The fluorescence color of QDs is a result of the chemical composition, the size, and the way the nanocrystals are processed. The original QD synthesis strategy utilized in the NanoRobo system allowed for the room temperature synthesis of green-emitting perovskite QDs, which are made using cesium lead bromide. NC Factory starts with cesium lead bromide perovskite quantum dots, but then introduces various halide salts to precisely tune their fluorescence color across the entire spectrum of visible light. Anions in these salts replace the bromine atoms in the green-emitting dots with either iodine atoms (to move toward the red end of the spectrum) or chlorine atoms (to move toward blue). 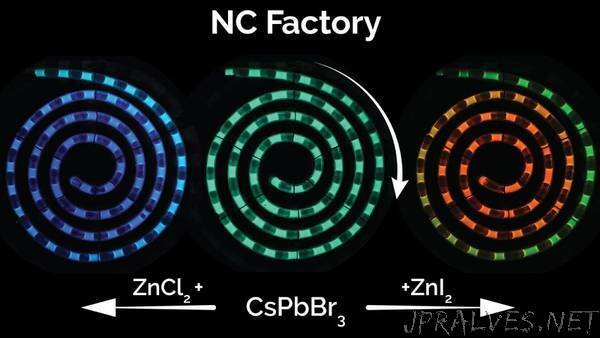 “Because the NC Factory can precisely control both chemical composition and processing parameters, it can be used to continuously manufacture perovskite quantum dots in any color with the highest quality,” Abolhasani says. The NC Factory system consists of three “plug and play” modules. The researchers developed a pre-mixing module to expedite the mixing of halide salts and quantum dots, in order to improve product quality. The system also incorporates a velocity sensor that allows users to monitor reaction times accurately. The synthesized QDs are then monitored in situ using the NanoRobo process-monitoring module. For example, perovskite quantum dots are attractive to the solar power industry for their efficiency, but they are still too expensive to be adopted on a large scale. And more than 60 percent of that cost is attributed to manufacturing labor. “The NC Factory system would require far less labor to operate continuously,” Abolhasani says. “We estimate that the system could cut overall manufacturing costs by at least 50 percent. It should reduce manufacturing costs of QDs for any application and should at least preserve – if not improve – the quality of the quantum dots. “We’ve submitted a patent for the system, and are working with industry collaborators to commercialize the technology,” Abolhasani says. The paper, “Facile Room Temperature Anion Exchange Reactions of Inorganic Perovskite Quantum Dots Enabled by a Modular Microfluidic Platform,” is published in the journal Advanced Functional Materials. Co-first authors are Kameel Abdel-Latif and Robert Epps, who are Ph.D. students in chemical and biomolecular engineering at NC State. The paper was co-authored by Corwin Kerr, an undergraduate student at NC State; Christopher Papa, a Ph.D. student in chemistry at NC State; and Felix Castellano, the Goodnight Innovation Distinguished Chair of Chemistry at NC State.